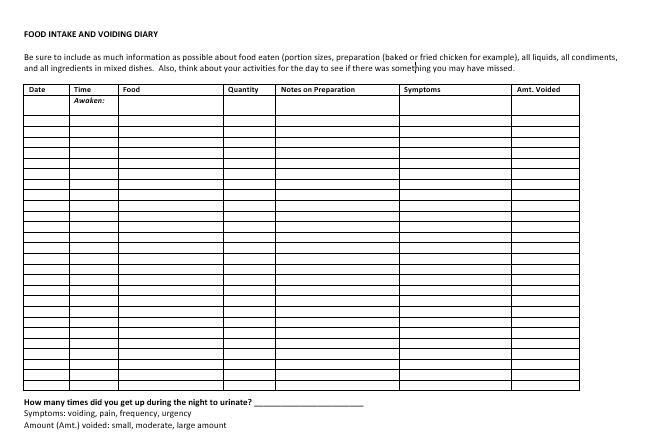 An important tool to use during an interstitial cystitis (IC) elimination diet is a food diary. Studies demonstrate that a food diary is helpful in raising awareness about food intake. A diary also helps you keep track of what you are eating to determine your reaction to specific foods and beverages. By writing down the foods, when, and how much you ate of a certain item, you can begin to figure out the foods that are okay to eat and the foods to limit. A food and symptom diary can also be helpful to determine which foods might trigger a longer-lasting IC flare. Taking the time to log the information will make it easier for you to identify other factors, which may also affect your IC symptoms, such as stress, exercise, or medicines. In addition, some with IC find that chlorinated water, chemically laden laundry products, and cold toilet seats can trigger symptoms. Myth—Allergy testing gives you a positive diagnosis of which foods to restrict. There are limitations with the currently available commercial allergy tests. In addition, these tests may lead to overly restrictive dietary choices. However, use of allergy testing to identify potential food and beverages for short-term restrictions to incorporate into a one-month elimination diet may be helpful.